Drupal exists because of its community. What started from humble beginnings has grown into one of the largest Open Source communities in the world. This is due to the collective effort of thousands of community members. What distinguishes Drupal from other open source projects is both the size and diversity of our community, and the many ways in which thousands of contributors and organizations give back. It’s a community I’m very proud to be a part of. Without the Drupal community, the Drupal project wouldn’t be where it is today and perhaps would even cease to exist. 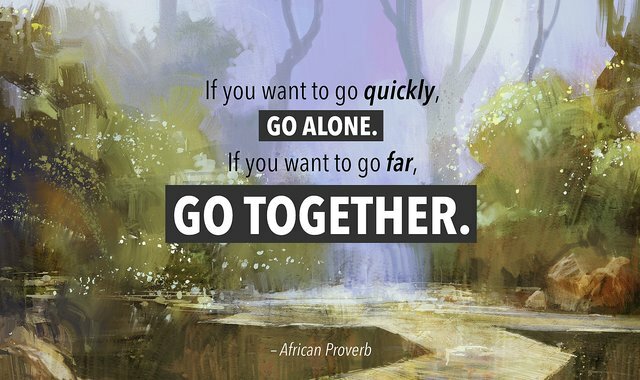 That is why we are always investing in our community and why we constantly evolve how we work with one another. The last time we made significant changes to Drupal’s governance was over five years ago when we launched a variety of working groups. Five years is a long time. The time had come to take a step back and to look at Drupal’s governance with fresh eyes. Throughout 2017, we did a lot of listening. We organized both in-person and virtual roundtables to gather feedback on how we can improve our community governance. This led me to invest a lot of time and effort in documenting Drupal’s Values and Principles. In 2018, we transitioned from listening to planning. Earlier this year, I chartered the Drupal Governance Task Force. 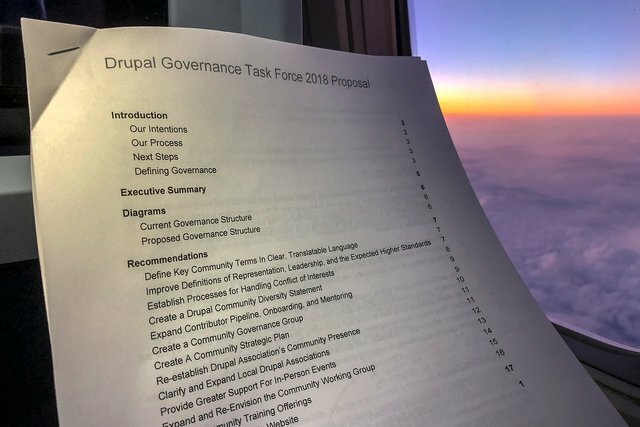 The goal of the task force was to draft a set of recommendations for how to evolve and strengthen Drupal’s governance based on all of the feedback we received. Last week, after months of work and community collaboration, the task force shared thirteen recommendations (PDF). Me reviewing the Drupal Governance proposal on a recent trip. I’m impressed by the thought and care that went into writing the recommendations, and I’m excited to help move them forward. Some of the recommendations are not new and are ideas that either the Drupal Association, myself or others have been working on, but that none of us have been able to move forward without a significant amount of funding or collaboration. I hope that 2019 will be a year of organizing and finding resources that allow us to take action and implement a number of the recommendations. I’m convinced we can make valuable progress. I want to thank everyone who has participated in this process. This includes community members who shared information and insight, facilitated conversations around governance, were interviewed by the task force, and supported the task force’s efforts. 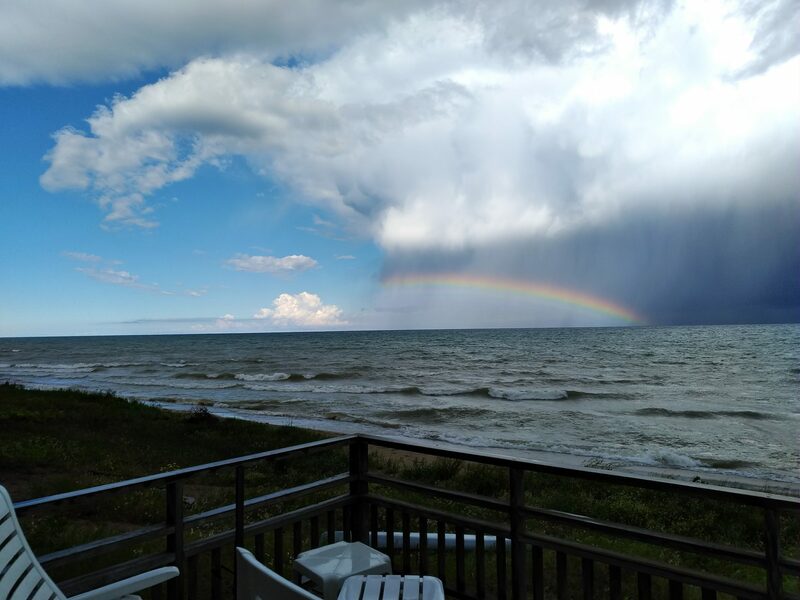 Special thanks to all the members of the task force who worked on this with great care and determination for six straight months: Adam Bergstein, Lyndsey Jackson, Ela Meier, Stella Power, Rachel Lawson, David Hernandez and Hussain Abbas.